OMAHA – Dr. Jeffrey Sartin has always been fascinated by science and medicine. The drive to figure things out drew him to treating infectious diseases. “But what I really like is making patients better,” said Dr. Sartin, who has joined the Infectious Disease/Travel Medicine staff at Methodist Physicians Clinic Regency. Sometimes it’s the little things that are most rewarding. He tells the story of treating a patient in his late 80s who had a vascular infection. 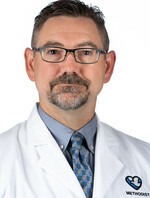 Dr. Sartin earned his bachelor’s degree and completed medical school at Emory University in Atlanta. He completed an internal medicine residency and an infectious disease fellowship at the Mayo Clinic School of Graduate Medical Education in Rochester, Minnesota. He comes to Methodist with a wealth of experience – he has been a board-certified internist since 1989, and he became a board-certified infectious disease physician in 1992. He most recently was an internist and infectious disease physician at Infectious Disease and Epidemiology Associates in Omaha. While he is involved in all aspects of treating infectious diseases, he is especially experienced with orthopedic infections, HIV and travel medicine. In addition to the Infectious Diseases Clinic at Regency, Dr. Sartin will see patients at Methodist Women’s Hospital and Methodist Jennie Edmundson Hospital. Wherever the location, Dr. Sartin looks forward to establishing relationships built on trust. To refer a patient or make an appointment with Dr. Sartin, call 402-354-1530.